Every single craving satisfied! Pumpkin Pie, Brownie, Peanut Butter, Chocolate AND it's a CLEAN TREAT! 1 - Heat your Quest Bar in the microwave for 10-12 seconds until it's warm enough to mash and mold into a cookie shape. 2 - Spray a pan with cooking spray and broil at 350 for 1 minute, remove and flip, broil on the other side for 1 minute, repeat 2 more times! 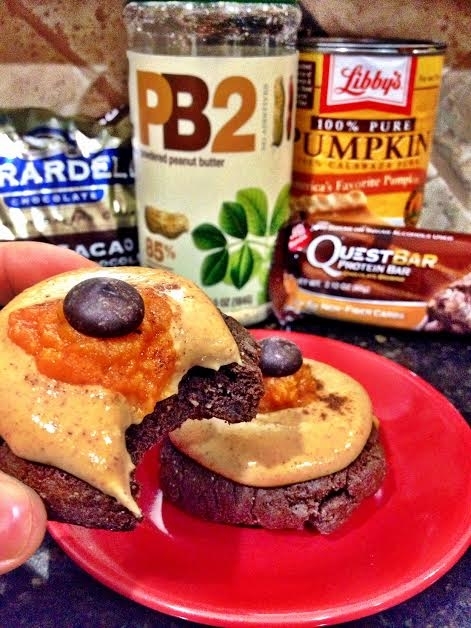 3 - Mix your PB2 in water and add in your pumpkin spice. 4 - Smother the mixture over your two cookies, add 1/2 tsp Pumpkin Puree to the center, top with your cacao chip and ENJOY!! !